PHOTO: Allen Ramsey, DWCPhoto.com. Highlands senior Mitch Cain goes in for the score in Wednesday's 36th District semifinal game against Newport Central Catholic. The Highlands Ladybirds basketball team may have expected another rematch with the rivals on The Hill in the 36th District championship Thursday at Bellevue. But that will not happen this year. The Newport Ladycats (13-13) earned their first trip to the title game since the district went to seeding two seasons ago with a 62-58 shocker over the Thoroughbreds on Tuesday in the 36th semifinals. "(Against Dayton) we did a good job rebounding," said Jaime Walz-Richey, Highlands Head Coach. "We need to continue to do that against Newport. They're very athletic. Against NewCath, they got a lot of points off offensive rebounds." That came after Highlands (20-10) earned its third straight 20-victory season with a convincing 78-33 victory over Dayton. But in search of back-to-back district championships for the first time since 2008 and 2007, the Ladybirds hope to continue playing good basketball and not let their guard down. Three years ago, Highlands started off slow in the district championship game against Newport leading just 2-0 with 5:20 left in the first quarter when Head Coach Jaime Walz-Richey and the coaching staff benched the starters. Highlands cruised from that point to a 66-27 victory over Newport. Highlands seniors Haley Coffey and Brianna Adler started as freshmen on that team. The other two seniors on this team determined to make sure that doesn't happen are McKenzie Leigh and Izzy Schultz. "Right now, the coaches have really put in our heads that focus and intensity need to be on (against Newport)," Coffey said. "I think if we play with the focus and we have the effort we did (against Dayton) we should do well. But that's as long as we stay focused as a full team." The Ladybirds played great defense against Dayton recording 20 steals on 28 Lady Devil turnovers. The Ladybirds outscored the Lady Devils, 18-2 in points off turnovers. Lauren Epperson led the way with six for Highlands. "We have to continue to defend like we are without fouling," Richey said. "We have to take the best match-ups to our advantage." That led another great night shooting the ball from the field and at the free throw line. Highlands made 26-of-53 shots for 49 percent and 23-of-27 free throws for 85 percent. Freshman Zoie Barth and Adler averaged double-digits entering the postseason and Leigh was close. Kylie Orr led Newport entering the postseason averaging 15.3 points per game and Star Yeager averaged 8.6. Highlands beat host Newport, 65-39 on Dec. 14. But Newport has played better since starting the season 1-4. The Bluebirds once again fell 82-40 to the Newport Central Catholic Thoroughbreds in the 36th District semifinals Wednesday. But Head Coach Kevin Listerman gave a number of reasons why the sun will eventually rise on the program. The Bluebirds return juniors Kyle Finfrock, Bradley Greene, Luke LaFrange and Braden Posey. He also said junior Morgan Race gave Highlands quality minutes down the stretch. Finfrock gave the Bluebirds consistency in the paint. NewCath saw three players score in double figures in its quest for its eight straight district championship. 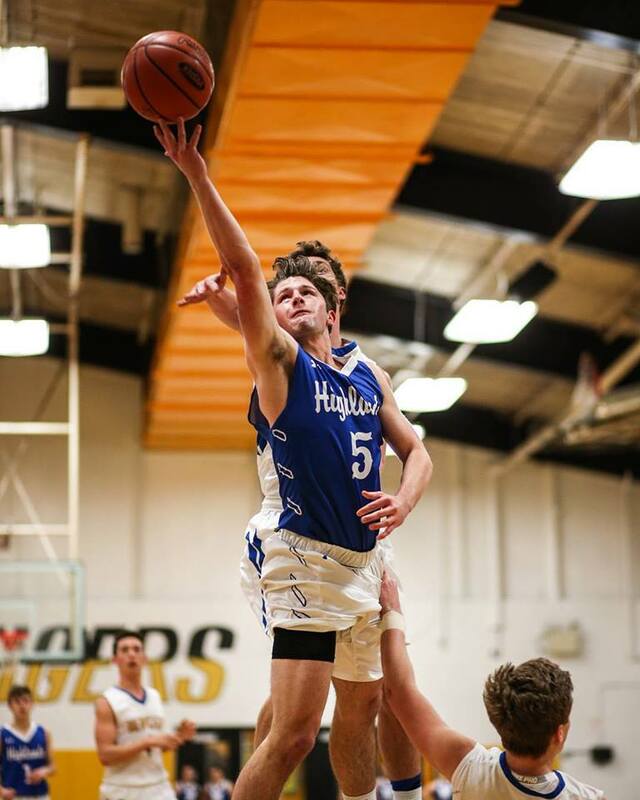 Fort Thomas resident Ben Weyer led the Thoroughbreds with 26 points on eight three-pointers with Brennan Hall and Brian Anderson scoring 11 and 10 respectively. "The biggest thing is we're learning to compete day-in and day-out," Listerman said. "We're sorry to see our seniors go because they laid it on the line for us. We tried to do the things we asked the kids to do. That's all you can ask for at the end of the year." Highlands graduates six seniors in Chandler New, Mitch Cain, Jared Dougherty, Bo Hebel and Nick Kendall. Hebel led Highlands with 10 points in the loss Wednesday. Cain led the Bluebirds averaging 13 points per game. "We didn't start off too strong this year," Cain said. "As a team, we never give up. We continued to push the younger kids. We got them to understand that what happened doesn't matter. It's the next game that matters. You just have to keep working hard and playing. That's what we did." Highlands last won a district championship in 2008. The Bluebirds last made the region tournament two years ago and last won it in 2001.